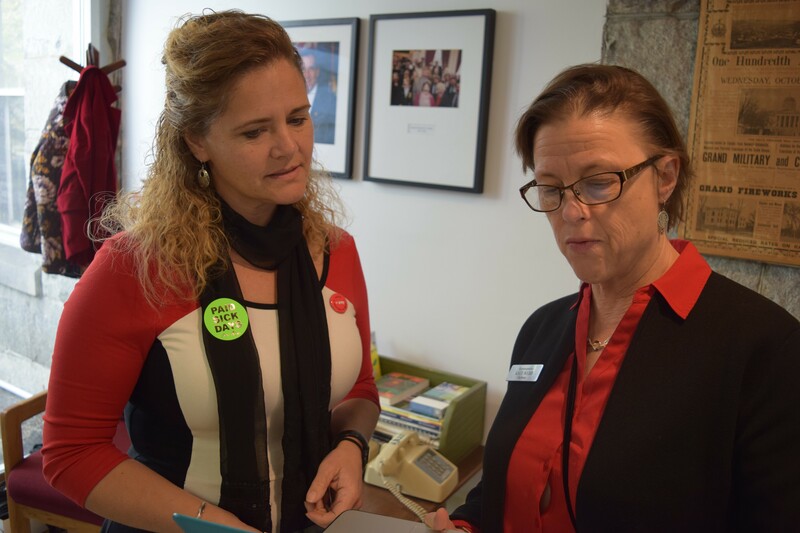 House Majority Leader Sarah Copeland Hanzas (D-Bradford), left, sports a sticker supporting a paid sick leave bill as she talks Tuesday with Assistant Majority Leader Kate Webb (D-Shelburne). Gov. Peter Shumlin surprised many Tuesday when he threw his support behind a long-languishing bill that would require companies to provide paid sick leave and urged passage this year. Among those surprised: Senate President Pro Tem John Campbell (D-Windsor), who said there's no agreement the bill will pass this session. “That was the first I heard the governor saying that,” Campbell said. Shumlin offered his backing Tuesday, saying that the legislation under consideration now would be easier on employers than previous versions. “I believe that H.187 is well on its way toward addressing the needs of employers with those of their employees, providing this important benefit to Vermonters in a measured, thoughtful way,” the governor said. Shumlin’s newly pledged support may give the bill momentum, but the notion that it will become law this year appears far-fetched. The bill has yet to pass either chamber, with only about a month remaining in the legislative session. It could theoretically reach the finish line this year if the House and Senate reached an agreement, as they did last year with a late-session bill to raise the minimum wage. But that doesn't seem likely with paid sick leave. The Vermont Democratic Party, however, quickly took to the Internet, using Shumlin's comments to sign up supporters. In an email blast to party members, executive director Julia Barnes, said, "We are finally ready to get paid sick days legislation across the finish line." Barnes' comments, paired with Shumlin's, suggest the governor and he Democratic Party are trying to rally their base in a year in which he's disappointed many of them. The governor has previously expressed skepticism about earlier versions of the legislation. The House General, Housing and Military Affairs Committee is likely to vote this week on the bill, said committee chair Helen Head (D-South Burlington), who agreed with Smith that it's unlikely to pass both chambers this year. The bill would require employers to provide at least three paid days off to employees who have worked 1,400 hours or a year, whichever comes first. After three years, employees could receive five paid days off. “We believe it’s really important for Vermont workers to be able to take time off when they’re sick or when their family members are sick,” Head said. She said Shumlin’s staff has been meeting with advocates and business groups to help shape a bill more palatable to business owners than previous versions, which would have required more time off more quickly. House Majority Leader Sarah Copeland Hanzas (D-Bradford), who owns a coffee shop, said she had reservations about earlier proposals. The 1,400-hour waiting period won her over, she said. “That really, truly says this benefit is only extended to employees who’ve made a long-term commitment,” she said. Other employers remain opposed. “To impose that on all businesses regardless of whether they can afford it, is just another burden,” said Bill Driscoll, vice president of Associated Industries of Vermont.